Combine the crushed chocolate wafers and the melted butter. Place a tightly packed teaspoon of the wafer mixture into each mini-muffin cup and press down firmly. In a food processor combine the ricotta cheese, cream cheese, 1/4 cup of the sugar, half of the orange zest, and the egg. Blend until smooth. Lightly grease the sides of the mini muffin tin with butter. Fill the cups with about 1 1/2 tablespoons of the cheesecake mixture. Place the mini muffin tin in a baking dish and pour enough hot water in the baking dish to come halfway up the sides of the mini muffin tin. Bake for 25 minutes. Transfer the mini muffin tin to a wire rack and let cool for 30 minutes. Refrigerate for 15 minutes. Use a small knife to gently pop the cheesecakes out of the cups. Just before serving, combine the remaining orange zest with the remaining 2 tablespoons of sugar. 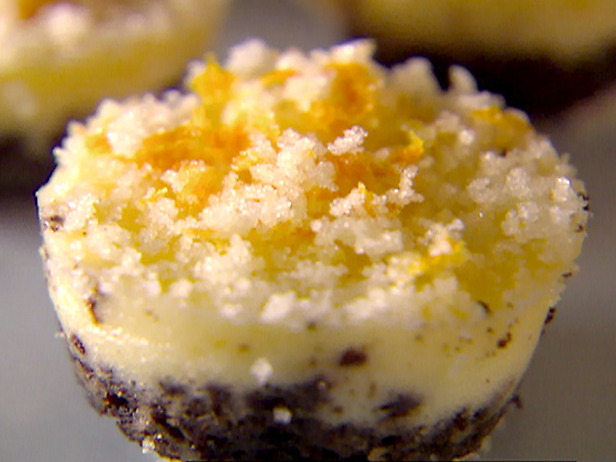 Top each individual cheesecake with about 1/4 teaspoon of the orange zest mixture and serve. yea right you LOVE her! a dose of pretty for wednesday! our casa smells oh so good! oh how i love imperial trellis! best guacamole recipe - hands down! i need to get organized!